A divine fowl with the ability to reflect the human heart like a mirror. Gaze upon its shining form with respect, and have your soul cleansed. Gaze upon its shining form with impudence, and you would do well to watch your back. 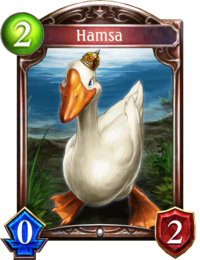 Local status effect for 3 turns. 9T9 turn cooldown. 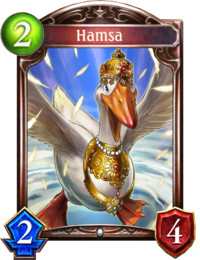 The hamsa (Sanskrit: हंस, haṃsa or hansa) is an aquatic bird of passage, such as a goose or a swan. Its icon is used in Indian and Southeast Asian culture as a spiritual symbol and a decorative element. It is vahana of Lord Brahma Gayatri, Saraswati and Lord Vishvakarma. The maiden on Hamsa's back may be Saraswati, the Hindu goddess of knowledge, music, art, wisdom and learning worshiped throughout Nepal and India. It is said that Saraswati used a hamsa as a mount. 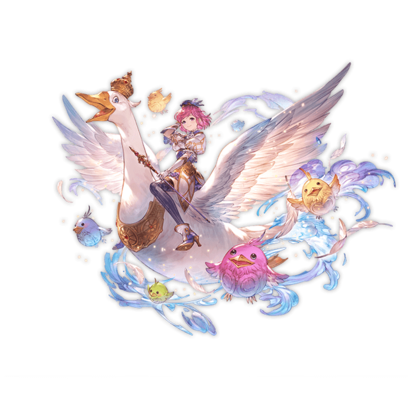 However, her identity is unconfirmed within the Granblue Fantasy universe. Fanfare: Gain +X/+0. X equals the attack of the strongest enemy follower in play. This page was last modified on 5 February 2019, at 04:13.